Osmotolerant yeast works well in high sugar doughs. Osmotolerant yeast is capable of growing at low water activity values. 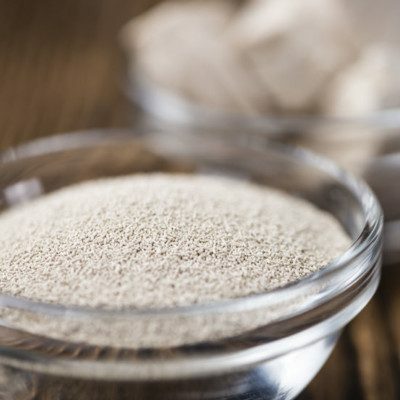 High solute concentrations have been differently classified as “osmotolerant.” Osmotolerant yeast is a special strain of instant dry yeast that performs better in high-sugar doughs than other yeasts do. Osmotolerance in yeast is determined by the genetic constitution of the organism and the conditions under which the organism is grown.3 The exact manner in which these gene complexes interact in an orderly fashion to provide the necessary osmotolerance in yeast is not precisely understood. In small amounts, sugar enhances fermentation, but when the amount of sugar exceeds about 4% of the flour weight, it creates osmotic pressure, and impedes fermentation by pulling water away from the yeast. With sugar concentration sometimes as high as 25%, like sweet doughs with a sugar content of 20 to 30% by weight, products such as Danish pastries, coffee cakes, doughnuts, etc. belong in this category. The osmotic pressures in sweet doughs are higher, due to increased sugar content. In such high sugar systems, either higher levels of yeast (7-10% based on a flour basis) is used to compensate the poor yeast activity or osmotolerant yeast is used. The use of osmotolerant yeast is more cost effective. Dried yeast is permitted for direct addition to food for human consumption regulated by FDA in the article 21CFR172.896. Chen, Shao L., and Feliks Gutmanis. “Patent US4420563 – Process for the Production of Osmotolerant Yeast.” Google Patents. Google, 13 Dec. 1983. www.google.com/patents/US4420563. Accessed 19 June 2017. Jermini, Marco F. G., Otto Geiges, and Wilhelm Schmidt-Lorenz. “Detection, Isolation and Identification of Osmotolerant Yeasts from High-Sugar Products.” Journal of Food Protection 50.6 (1987): 468-72. Panchal, Chandra J. “Yeast Strain Selection.” New York: Dekker, 1991. Print. “CFR – Code of Federal Regulations Title 21CFR172.896.” Accessdata.fda.gov. 1 Apr. 2016. www.accessdata.fda.gov/scripts/cdrh/cfdocs/cfCFR/CFRSearch.cfm?fr=172.896. Accessed 19 June 2017.